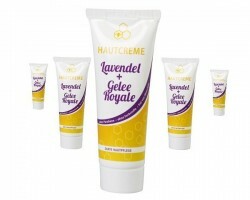 Gelee Royale cream There are 8 products. Due to high quality ingredients such as royal jelly, Aquapront® (as the effect of moving water), hyaluronic acid, vitamin B3, and shea butter, provides moisture to the top layer of the skin all day. 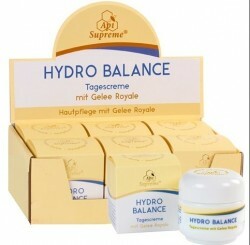 Smooth face cream with high-quality ingredients such as Royal jelly, Karité butter, Hyaluronic acid, Vitmin E and B3. Moisturizing normal skin / mixed skin. Skin compatibility dermatologically approved. 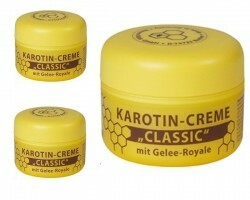 Carotin Creme Classic with royal jelly. For normal and mixed skin.This rich, moisturizing, soft cream with royal jelly, vitamin E, B3, panthenol and carotene is the ideal cream for the whole day. 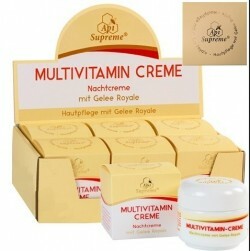 ApiSupreme Multivitamin CreamIs a high-quality night cream that pampers your skin with valuable oils such as avocado, almond oil and active ingredients such as ginseng extract, royal jelly and vitamin E and A.